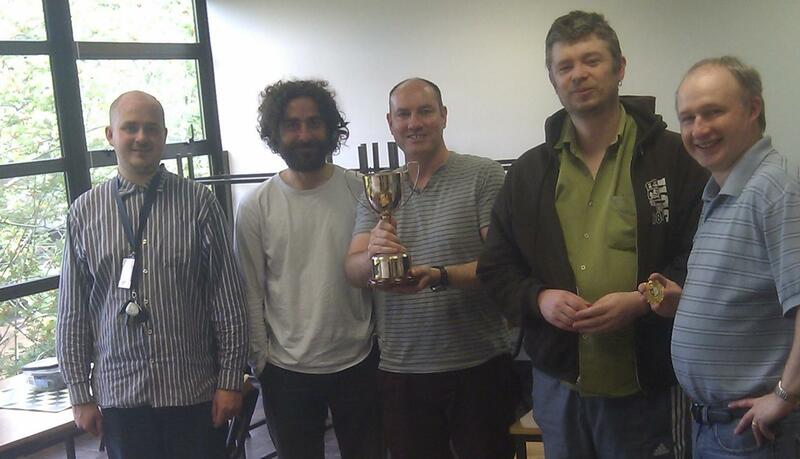 Galway Chess Club has won the Connaught Chess League by beating the combined Castlebar/Westport team 3.5 to 1.5 in a tight final match played in NUIG on Sat, 21st July 2012. The Connaught League is split into North and South Connaught divisions. The title is decided by the final match between the two division winners. This year North Connaught consisted of Manorhamilton, Castlebar/Wesport (or “CastleWest”) and Ballina while South Connaught had Galway NUIG and Ballinasloe. The league website is http://connaughtchessleague.yolasite.com. 1.5 thanks to wins from Felix on board 1, Paul on board 2, Ger (debut in the league) on board 3 and a nice draw for Amos (also debut) on board 4. We were due to play NUIG in the next round but unfortunately Fintan had to withdraw the team, so we were through to the semi-final against Ballina. We beat Ballina 5-0! thanks to wins from the very strong Joona on board 1, Indy (who also played for Galway last year) on board 2 and wins for the three amigos Felix, Paul and Ger on boards 3,4 and 5. This set up a repeat of last year’s final against Castlebar, who have now included Westport in thier ranks. The Galway team was Joona on board 1, David Path on board 2, and once again the three amigos Felix on board 3, Paul on board 4 and Ger on board 5 (if it ain’t broke, don’t fix it!). Based on ratings, Galway had the advantage but we were black on three boards so a close match was expected and it was tight and tense in all games. Joona as black, won probably the most important game against the Castlebar number 1 Joe McDonnell, a very tactical c3 sicilian. David (Path) as white beat David Baird by breaking through on the queenside in a tough battle. The always solid Felix drew as black against the equally solid Eamon, team captain and main organisor of the league. I beat John Hensey’s pirc defence in a tight game until it exploded into life after a central pawn break resulted in John losing the exchange of knight for rook and the attack on his king was too strong to stop. Ger, who surprisingly played a Caro Kann against 1 e4, went up a pawn early against Michael O’Donnell but left a big hole on d6 for Michael to dominate with his knight and dark bishop and Ger finally lost a very tactical and interesting game. So after the dust had settled, Galway were crowned the 2012 Connaught League Champions and keep the trophy until next year’s league. see the photo attached. Thanks to all who have given up their time, assisted and played so well in this year’s event. Thanks to Castlebar/Westport for another entertaining final, plus all the work from Eamon in setting up the league. Anyone who is interested in representing the Galway team in next year’s event can contact me. Maybe one year we could even enter two teams from the Galway club.